- Three folding built-in Auto Grip Systems safely lock instrument(s) in place. - The Folding Backrest supports instrument securely, has multi-angle position adjustment and folds up securely for travel. 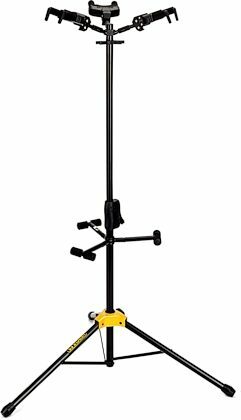 zZounds is an authorized dealer of Hercules Stands products. Hercules Stands Warranty ﻿Hercules stands has a generous Limited Lifetime Warranty which is valid with a consumer's receipt. The only things the warranty does not cover are plating issues and defective rubber components.